3. French Voice, French SMS and English Manual. 4. Spanish Voice,Spanish SMS and English Manual. 5. Italian Voice,Italian SMS and English Manual. 6.Germany Voice, Germany SMS and English Manual. 7.Slovakia Voice ,Slovakia SMS and English Manual. 8. Portuguese Voice ,Portuguese SMS and English Manual. 9. Polish Voice, Polish SMS and English Manual. Note: Please leave the message for the language choose , So we can send you the alarm with your choose ,If you don’t leave the message , We will send you the alarm language in English. (*) SIM card is not provided. You should buy SIM from your local mobile operator. Q1. Why Should I install a security alarm system? -The primary reason is that a security alarm system protects your home and family and gives you added peace of mind. -A security system also adds value to your home at time of resale. More and more people today are concerned about break-ins and are looking for a home with an alarm. -A security system also entitles you to a 5% to 15% reduction in homeowner’s insurance, depending on your insurance company. Q2. How hard is it to install a security alarm system? Actually, there is no installation in wireless appliance device that can be hidden out of sight, and simple plugs into a standard wall outlet. Sensors can be placed where they are needed for best protection. The siren plugs into a wall outlet or control panel. The key is portable. A wireless home security system uses small radio transmitters instead of wires to send the necessary signals between the system sensors and control panel. This means there is no drilling necessary and you can take the system with you when you move. 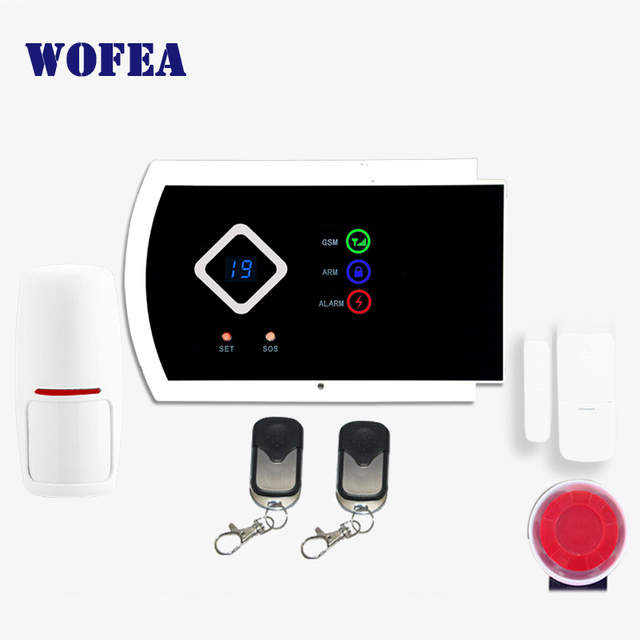 These days, a wireless security system for home or businesses are quite affordable, you will be paying only for equipment. the cost will depend on the actual items you select for your system, the peace of mind that this level of home security brings you is priceless. Q4.Do you offer any guarantee on the alarm system? Yes, we provide guarantee on Security Alarms, time based on specific items (excludes batteries). As you know that sometimes have to pay extra cost and time which finally cause more cost than you buy a good quality one. We never neglect the quality of the products to ensure continued sales. Q5. What is the difference between a “HARD WIRED” or “WIRELESS” System? A hard wired system is installed when a basement’s ceiling is unfinished. Tiny contacts are hidden in the door frame or window well. The actual wires are out of sight. For finished basement ceilings or additions beyond the original foundation wireless transmitters are used to send signals to the control panel. Mainly, we offer wireless alarms. A benefit of wireless is that with no wires between components, the alarms are easy to install, there¡¯s no damage to home decor or carpets to lift. Q6. What are the main components of a security system? The main components of a security system consist of control panel, sensor, siren etc. 1) Control Panels are the “brains” of the security system. 2) Smoke/Fire sensor: an always on smoke sensor that detects smoke and send immediate signal to control panel and call you. 3) Gas detector: Gas detector provides early warning of dangerous LPG or nature gas levels. 4) Motion sensor: Detects movement in rooms, Hallways and stairs. 5) Panic button: send an instant emergency signal to control panel and call you for an immediate response. 6) Door/window sensor: these sensors are used to protect the opening of both doors and windows. Q7. Would my wireless internet connection interfere with the wireless alarm? Your wireless alarm will utilize a dedicated 433 MHz narrow band radio channel which is exclusive for the security industry and as such unlikely to receive interference from your wireless internet connection. Q8.Can I add extra more sensors to my alarm package? YES. Extra sensors can be added to your alarm package if required; at additional costs. Q9. What happens if I am using the telephone and the alarm triggers? If you are using the telephone when the alarm triggers, the system will automatically seize the line and override your usage to call pre-record number or transmit an urgent signal to the Customer Monitoring Centre. This feature ensures that the alarm is always set as a priority for emergency notification. Q10.If the power goes off, will my alarm system still work? Yes. In case of a power loss, the back-up battery will be activated to maintain your alarm protection for several hours. It is re-charged when the power returns. Q11. Do pets affect the system and if so is a pet detector available? Pets do affect the system unless the PIRs are masked or pet friendly. We recommend you use magnetic door contacts to protect the building in areas where animals may be moving. Currently, you can pay using Visa, MasterCard, QIWI, Western Union, Maestro debit card, WebMoney and bank transfer for alipay. More payment options will be available on AliExpress in the future. 2. We only ship the goods to the Alipay confirmed address. We arrange shipping way according to buyers’ location and order quantity. We may use Registered Airmail (by POST OFFICE), EMS, UPS, DHL or other shipping way. If you have any question, contact us before buying. Also, please confirm that your country customs can accept such product and how much of the customs duty. And this item comes with 2 Years warranty. If there is any problem, buyer should contact us within 15 days after receiving item for any return inquiries.